Prof Kang Li, Chair in Intelligent Systems and Control, School of Electronics, Electrical Engineering and Computer Science at Queen's University Belfast, has won the Best Paper Award at the “2014 International Conference on Life System Modelling and Simulation (LSMS2014) and 2014 International Conference on Intelligent Computing for Sustainable Energy and Environment (ICSEE2014)”, held in Shanghai, China in September. 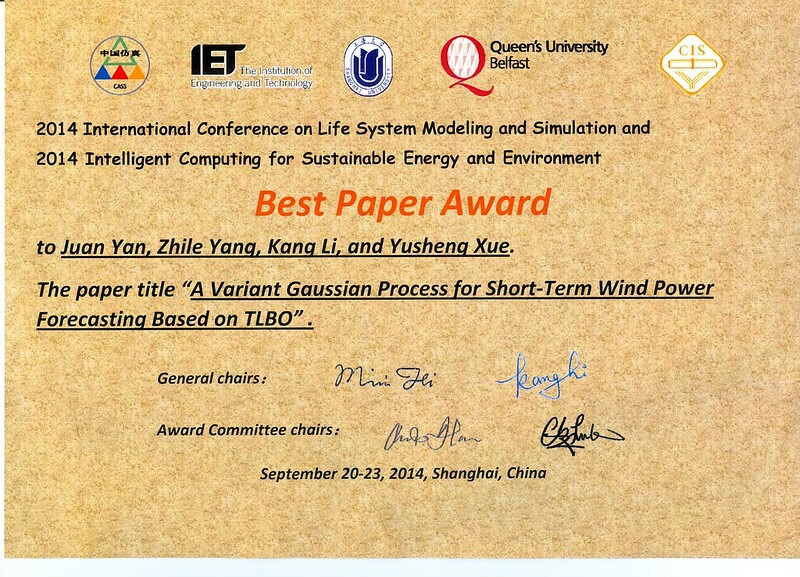 The Award was for work on " A Variant Gaussian Process for Short-Term Wind Power Forecasting Based on TLBO ", which Prof Li co-authored with his PhD student Juan Yan, Zhile Yang and colleagues from State Grid Electric Power Research Institute, China. This work is part of the research linked to the current EPSRC project on “Intelligent Grid Interfaced Vehicle Eco” and the £2.3 million Science Bridge project on sustainable energy and environment, of which Prof Li is the Co-Investigator.